Queen Elizabeth II and Meghan, Duchess of Sussex visit Chester Town Hall on June 14, 2018 in Chester, England. Meghan Markle married Prince Harry last month to become The Duchess of Sussex and this is her first engagement with the Queen. During the visit the pair will open a road bridge in Widnes and visit The Storyhouse and Town Hall in Chester. Queen Elizabeth completed her accessories with a pair of pearl studs and a matching necklace. 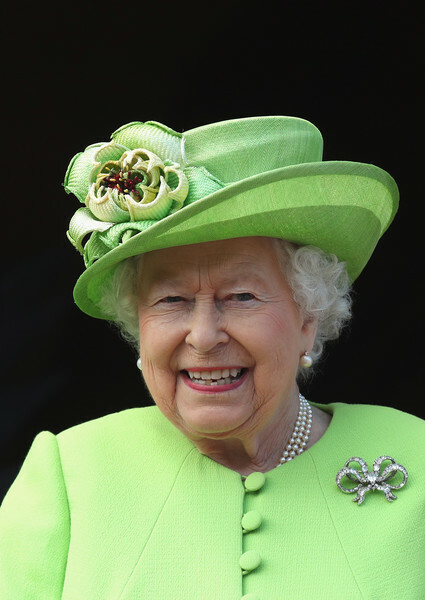 Queen Elizabeth II donned a lime-green Rachel Trevor-Morgan hat to match her coat for her visit to Chester Town Hall. Queen Elizabeth II styled her coat with an elegant diamond brooch.